Hatching is the process through which Dragon eggs are incubated in order for Dragons to come to life. The amount of time it takes to incubate an egg will depend on what Dragon will hatch. The higher the rarity and the more advanced the Elements, the longer it will take to incubate. Usually, the longer the time it takes to hatch, the rarer the Dragon will be. Hatching times vary from instant for Boss Dragons to 4 days and 19 hours for Divine Dragons and are affected by the VIP Status. Hatching Dragons can only be done in the Hatchery. Eggs need to be incubated there until they are ready to hatch. Once the incubation period is complete, the Trainer can select the Hatchery and press the icon of the Dragon which will bring up a window with the Dragon's egg. The baby can hatch from its shell after repeatedly tapping the egg and cracking it open. After the Dragon is hatched, it will give an amount of experience to the Trainer. Dragons that take longer to breed will give more experience points. In the same window, its name will be shown underneath its image, its Element(s) above its name and its rarity in the top-left corner of the hatching window. There is an additional button in the right of the Dragon which can be pressed to bring up its Base Codex Entry. If a species of Dragon is hatched for the very first time, the icon will be displayed in its right, signaling the Trainer has obtained a new Dragon and its Dragon Collector Points value along with the button in its right. None of these are shown for Clan Dragons. Additionally, after the same, brand-new Dragon is placed in a Habitat, the Codex will appear and will fill in that Dragon's snapshot. If the Dragon is part of a Dragon Codex collection, its snapshot will be filled in, instead, in the Collections menu. If the Dragon is currently part of an ongoing Collection Event, then its snapshot will be filled in inside the collection screen. Finally, a secondary window will pop up, informing the Trainer that they have collected a new Dragon. The window will show the Dragon's baby picture, its Elements, its Codex Entry and its base Dragon Collector Points. Closing the window is done through the button. The hatched Dragon can then be placed into one of the Habitats or the Dragon Vault through the option. This option will take the Trainer to either the Dragon Vault or the closest, fitting Habitat. Aside from this possibility, the Dragon can also be sold on the spot through the option. If there are no empty, fitting Habitats for the baby Dragon to be placed in or there are no free spots in the Dragon Vault, the Sell button will be replaced by the button and pressing it will take the Trainer to the Habitats tab of the Main Shop. However, if the Trainer has fitting Habitats that can be upgraded to receive additional spots, or if a fitting Habitat was just finished being built and the is shown atop it, instead of the Shop button, the Trainer will receive the button. Pressing this button will take the Trainer to the nearest fitting Habitat that can be upgraded, or to the one that was just built and is awaiting completion through being selected. The shell of the eggs are in concordance to the appearance of the Dragon. All Dragons have their very own egg, except Boss Dragons, whose eggs are that of their regular counterpart. These Dragons are incubated instantly after being sent to the Hatchery and are displayed directly in their adult form after their egg is cracked open, as they do not have a baby form. Community Hatching is an exclusive method and the only way through which Clan Dragons can be incubated. This involves one or more members of a Clan incubating and hatching a certain number of eggs belonging to the same Dragon in order to fully hatch and use that Dragon. Once a Clan Dragon is obtained by a Clan after its corresponding Dragon Pieces have been won from Clan Events, it will be stored under the Clan's Collection menu, instead of the inventory as with regular Dragons. From this menu, each member can send an egg to their Hatchery through the option. Multiple eggs can be hatched simultaneously so long as there are nests available in the Trainer's Hatchery. Each egg has a set hatching time which must be waited (unless a member chooses to speed up the process by paying with Gems) and this time is unaffected by the VIP Status, regardless of the Trainer's VIP Level. Once the hatching time has ended, selecting the Hatchery and choosing the Dragon's icon will bring up the window for cracking its egg open. Once the Dragon is hatched, its rarity will be shown in the top-left corner of the window. No option for accessing its Codex Entry will be shown, nor its Elements, as Clan Dragons have no entry in the Dragon Codex nor they possess any Element. Additionally, it will give no experience and DCP points and there will be no option to place or sell the egg, the only option available being to close the window. Any egg hatched by a member of the Clan is added to the collective count of hatched eggs until the total number of eggs needed is met. The counter is shown under the newly-hatched Dragon and in the Collection menu of the Clan. Any eggs that are hatched over the required number are discarded. Hatching Events are events whose sole objective is hatching Dragons in order to win the prizes offered. Points are given based on a Dragon's rarity, where the higher the rarity, the more points are given. Boss Dragons and Clan Dragons give no points. Solo Events require hatching Dragons as one of their objectives. Breeding is the main way for obtaining Dragon eggs. Pairing two adult Dragons in the Breeding Den will produce a Dragon egg after a while which is then sent to the Hatchery in order to incubate and hatch. 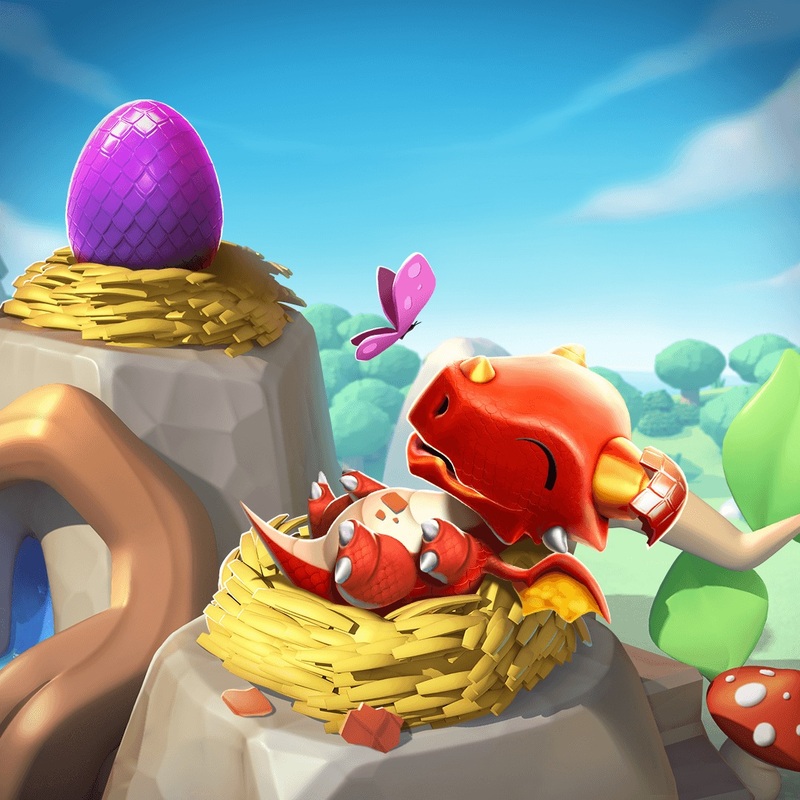 The amount of time it takes for a Dragon to be hatched is determined by its Elements and breeding time while an active VIP Status of Level 2 or higher reduces the amount of time by 20%. The rounding up applies only to the last digit. This only applies to the Elements of a Dragon that do not require awakening. Thus, only the base Element applies to all of these Dragons because their secondary Elements need to be awoken. As such, all Dragons with that base Element have the same breeding time, regardless of their other Elements. The Boiling Dragon possesses the Fire & Water Elements and has a breeding time of 240 minutes (4 hours). Thus, without VIP, the hatching time is 6 hours and 30 minutes while with VIP, the hatching time is 5 hours and 12 minutes. The Storm Dragon possesses the Wind, Energy & Void Elements and has a breeding time of 1,320 minutes (22 hours). Thus, without VIP, the hatching time is 1 day, 5 hours and 20 minutes (in the game, only the first two units of time are displayed) while with VIP, the hatching time is 23 hours and 28 minutes. The Titan Dragon possesses the Legendary Element and has a breeding time of 2,880 minutes (48 hours). Thus, without VIP, the hatching time is 2 days, 9 hours and 40 minutes while with VIP, the hatching time is 1 day, 22 hours and 8 minutes (in the game, only the first two units of time are displayed). The following Dragons do not follow this formula and thus have their own hatching time. Aside from an active Level 2 VIP Status, which reduces the hatching and breeding time by 20%, any ongoing hatching time is also reduced by 60 minutes whenever the Trainer activates Ruptia's ability and by 6 hours whenever Chronosian Seals are forged or Chronos' power is used. The entire hatching time can also be sped up in exchange for Gems. Update 4.2 slightly altered the graphical aspect of the post-hatching window: the cornered rarity icon is now smaller, the name and Element(s) of the Dragon are now shown underneath it inside a box and the button has been replaced by the button while the icon was replaced by the icon. Before this update, the name of the Dragon was above it while its Element(s) was/were on the left-hand side of the screen. Additionally, the button and the Dragon Collector Leaderboard score were moved from the left side to the right side of the window. Update 4.0 added the Dragon Collector Points value of new Dragons to their post-hatching screen as part of the new Dragon Collector Leaderboard feature. Update 3.2 made it possible for eggs, that are purchased while the Hatchery is full, to be sent to the inventory. Update 2.9 made the Dragon Codex collections screen pop up whenever a Dragon with an entry in it is being hatched for the very first time. Update 2.4 introduced Community Hatching. This page was last edited on 5 April 2019, at 10:24.